A group of Utah State University graduates recently launched a company called PoliticIt that uses machine learning to gauge the popularity of political candidates by measuring their digital influence. Sure, PoliticIt’s system has proven remarkably accurate in predicting winners, but its real promise is in leveling the playing field between the haves and the have-nots in political campaigns — democratizing democracy, if you will. It Scores as of May 31, 2012. The premise behind PoliticIt is simple: Gather and crunch as much data as possible to create a candidate’s It Score, which is a measure of digital influence that takes into account factors such as a candidate’s digital footprint and citizens’ sentiment toward the candidate. To make the scores even more accurate, PoliticIt incorporates machine learning algorithms that digest the results of elections and other events recalculate which factors or which areas of digital influence are actually the most important in any given race. PoliticIt claims that in the more than 160 elections is has tracked thus far, the candidate with the higher It Score won 87 percent of the time, even in races where conventional wisdom, campaign spending and polls suggested a different winner. That’s all fine and dandy and makes for good press, but co-founder and CEO Joshua Light told me PoliticIt is more about data and correlations than it is about causality. What he means is that as long as the It Score actually correlates strongly with who wins and loses elections, PoliticIt just wants to give candidates a way to track it and, if they’re so inclined, figure out ways to boost it. As for the actual politics — publicly predicting who’ll win any race or determining what policy changes might improve popularity — Light and his team will leave that to political scientists and other experts. For now, in an era when money is pouring into political campaigns like never before, PoliticIt’s simple goal could be enough. When its software is generally available, Light said he hopes it “bring[s] down that barrier of entry for people who want to run for office” by giving them a better idea of how they’re faring against their opponents in the digital realm and then figuring out how to spend money accordingly. “We think this is something that’s going to be revolutionary for our political system,” he said. A sampling of the data sources PoliticIt tracks. What sets PoliticIt apart from other services for gauging influence or predicting elections, Light said, is its focus on empowering the candidates. Yes, InTrade might be a fairly accurate predictor of who’s currently the frontrunner in a race, but its methodology is a something of a black box and IT doesn’t offer candidates any means of changing their fate. 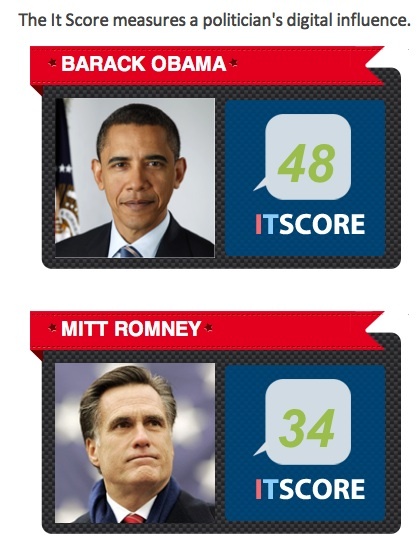 PoliticIt is more like Klout for politics. Not only does it gives candidates a score they can watch increase and decrease in relation to what they say or do, but it also hopes to let candidates identify other individual influencers to target. Targeting one individual with a loud voice might be a lot easier than trying to reach an entire room. Considering how important big data and analytics, generally, have become to political campaign efforts, it’s difficult to argue with PoliticIt’s thinking. In presidential politics, candidates have invested heavily in analytics and targeted marketing efforts for years, and are now starting to get into the big data space by building Hadoop clusters and analyzing the the firehose of data coming from sources such as Twitter, Facebook (s fb) and other websites. I’m even cautiously optimistic the advent of big data might actually change the current state of election-season politicians concerning themselves more with being popular than with being visionary. Being able to analyze large amounts of data in near real-time means being able to figure out in a hurry whether or not a strategy is working. Maybe the data will show that big ideas have a bigger impact on a candidate’s influence than do fence-sitting platitudes. The Logan, Utah-based PoliticIt has a long way to go before it’s a household name among campaign organizers, but it’s onto something. Even if candidates with bigger war chests might always be able to invest in the latest and greatest techniques, the idea of putting advanced digital-influence analysis into the hands of every candidate is pretty powerful nonetheless.